Having a parent that is an alcoholic can be stressful and confusing for a child at any age. The mixed emotions involved in alcoholism cause children to blame themselves for their parent’s behavior. The most important thing to teach any child dealing with a parent’s addiction is that it is not their fault. So what else can you do to help them? Your parent’s alcohol addiction is probably obvious, so ignoring the issue and pretending that everything is normal will not help them. Since your parent is the one with the addiction, the chances of you inheriting the addictive behavior are higher. So what can you do? You need to accept the fact they have a problem. If you have already accepted it, you can make plan to avoid falling into alcoholism the way your parents did. Don’t try to keep all of your emotions locked up. Hiding the pain of your parent’s addiction will only cause you more problems. Every child needs a good relationship with their parents, and not having that could cause someone a great amount of stress and grief. You’ll need to find someone that you can talk to, whether it is a friend, family member, or even a teacher. Talking to others about the issues can help you to heal and process your feelings. 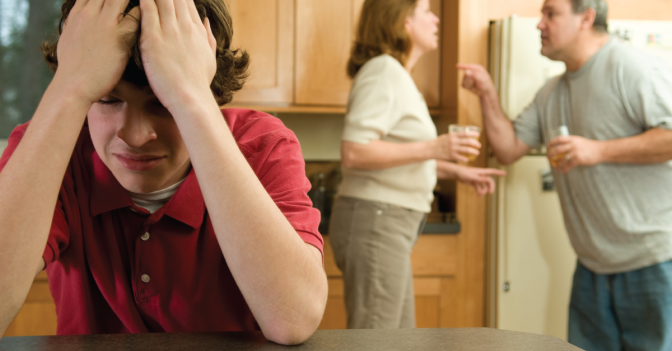 Children often feel like it would be disloyal of them to discuss their parent’s issues with anyone else. Even though the parent probably doesn’t want people to know about their addiction, it will only further hurt the child to remain silent about the issues. Best thing that any child of an alcoholic can do to help them is to actively seek out a counseling program for the whole family. There are many professional treatment facilities that can help an alcoholic and their family members recover from the stress and pain. One of the largest and most well-known organizations designed to help alcoholism is Al-Anon. This organization offers different kinds of treatment programs and counseling for people who struggle with alcohol addiction. In Al-Anon, they also offer programs for teens called Alateen. This program is for younger people who live with someone who has problem with alcohol addiction. Alateen offers each child a safe and welcoming atmosphere. If you think that your parent is ready to get professional help for their addiction, contact a treatment center near you.